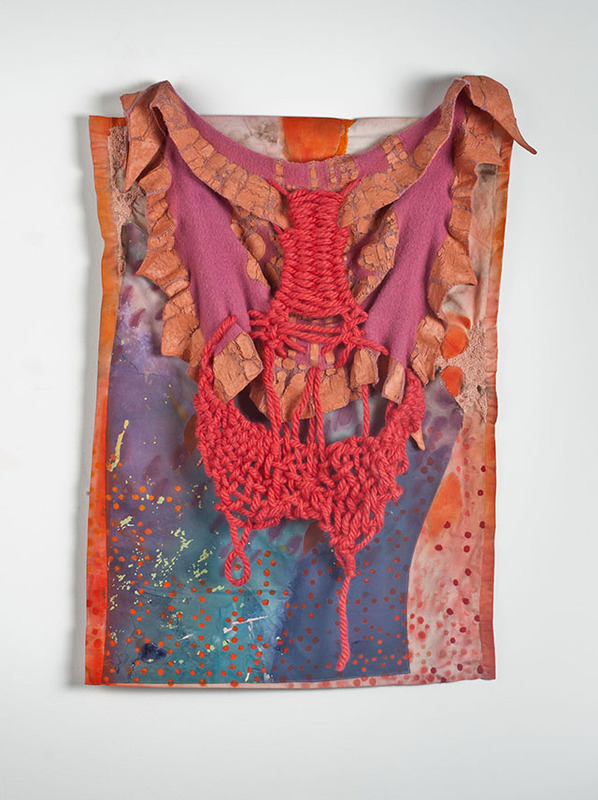 My current body of work is constructed from yarns, threads, fabrics, and thick applications of paint. Most of my studio time is devoted to hand-embroidery and stitching together various collaged materials. Compositions are never planned. Rather, they develop slowly over time through a process of arranging, looking, rearranging, and looking again. As I work, I am searching for tactile combinations and optical illusions that capture attention, rouse sensations of curiosity or wonder, and cause the viewer to linger. I don’t recall ever deciding to be an artist. I was a maker as a child and just never stopped. When I was 18 I decided to go to art school, but I majored in Textile Design and thought I would pursue a career in the textile industry afterwards. I discovered along the way that I was happiest tinkering with materials and ideas rather than worrying about pleasing a client or creating a product to sell. I grew up in WV. My earliest childhood memories are of playing in the woods with my older sister and neighborhood friends. Hours were spent constructing houses out of sticks or concocting “stews” out of leaves, berries, and other natural materials. I suppose these are common childhood activities, but I relate this type of play to how I work in the studio today. I don’t seek out extravagant supplies. Rather, I make do with the materials I have at hand. There are no rules or proper steps to follow. I combine materials based on gut impulses and let a loose plan develop as I work. In today’s digital age, we quicken pace, span great distances, and become “friends” with people like never before. But in our desire to be faster, go farther, and have numerous contacts, we often fail to fully connect, or actively engage. I consider visual experience and the role slow seeing plays in connecting us to our world and to our sense of physical presence. The images, materials, and processes I work with require us to slow. While working in the studio I make every effort to return to a world that precedes language and knowledge. I rely heavily on chance material manipulations and inventive construction methods to transform common materials into images that refuse to be named, identified, or fully understood. To be defined once and for all, to name, is to erase all desire. When something can be named, we move from point A to point B as quickly and efficiently as possible. When something is unnamable, or when the familiar is made mysterious or indefinable, it yields a continuous potential of meaning and stimulates a desire to keep searching. 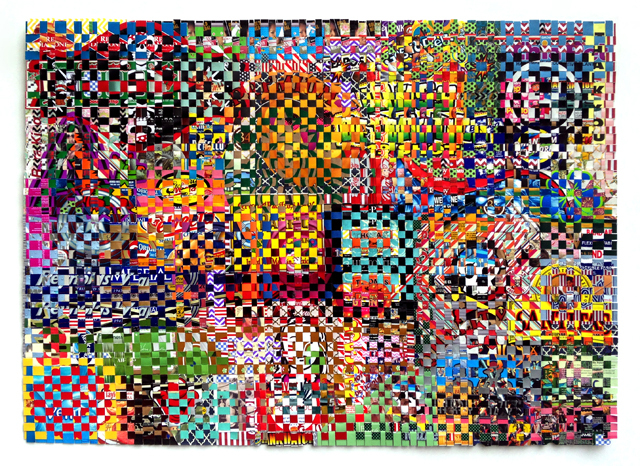 I use time-intensive fiber processes such as embroidery, knitting, and crochet to influence both the length and the quality of a viewer’s perceptual involvement. 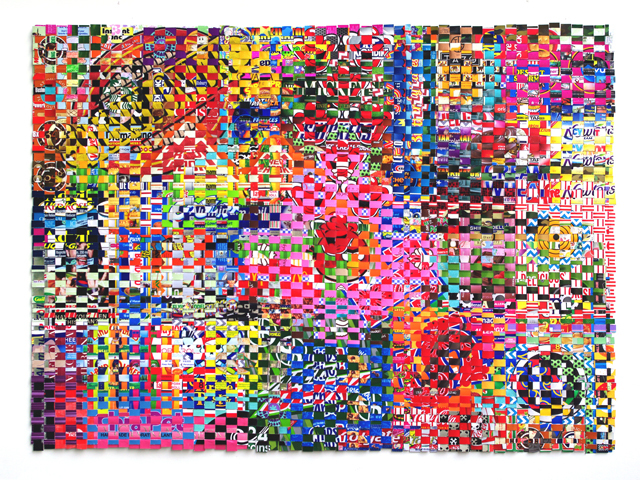 Viewers become entangled in visually picking apart the minute details of these accumulative processes, but I believe their captivation also stems from a human desire for the intimacy, connection, and human interaction that is embodied in each stitch. I love the uncertainty of the search. I slowly and steadily toil away. I spend many months on each piece, and never know if the hours of stitching will amount to anything. Making art the way I do is a challenging puzzle whose solution always seems to be just beyond reach. When a piece does finally reach a point of resolution, there’s a satisfactory high, but I never stop searching. I always work on multiple pieces simultaneously so there is never any down time in the studio. I suppose I’m addicted to the cycle. There are many artists that influence me for many different reasons. I may be drawn to a particular artist for material reasons, their use of color, their conceptual ideas, or maybe a combination of all three. The list grows regularly. To name a few: Sheila Hicks, Josef Albers, Karla Black, Robert Irwin, Sati Zeck, Fabienne Lasserre, and Iris Eichenberg. 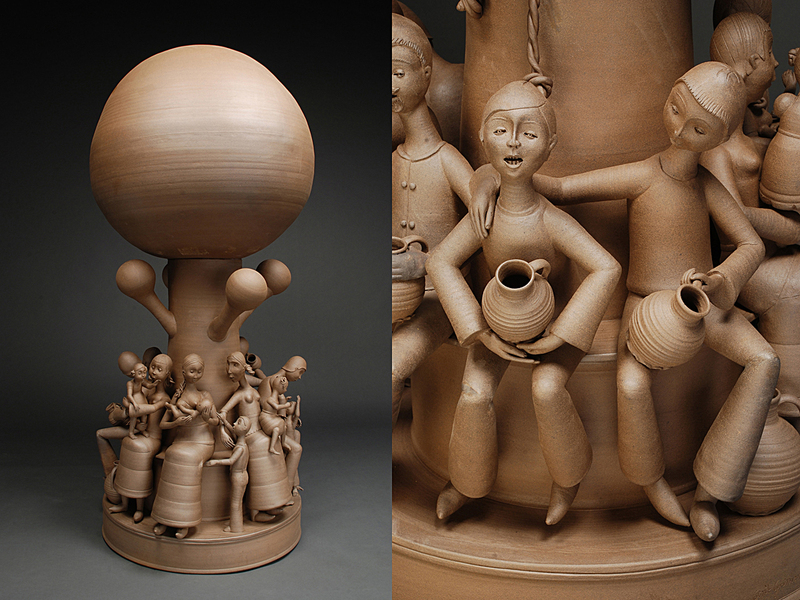 The two activities that fill my studio time – making and observing – also fill my leisure time. I love being productive and working with my hands. I cook and bake, sew clothes for myself from thrift store finds, and play around on my knitting machine designing items for erineleanor, a small business that I run. I also love feeling connected to the surrounding physical world. I hike in the woods or wander my neighborhood for miles. My only goal on these long walks is to be attentive, to observe my surroundings with all of my senses, and to notice things that would otherwise go unnoticed. 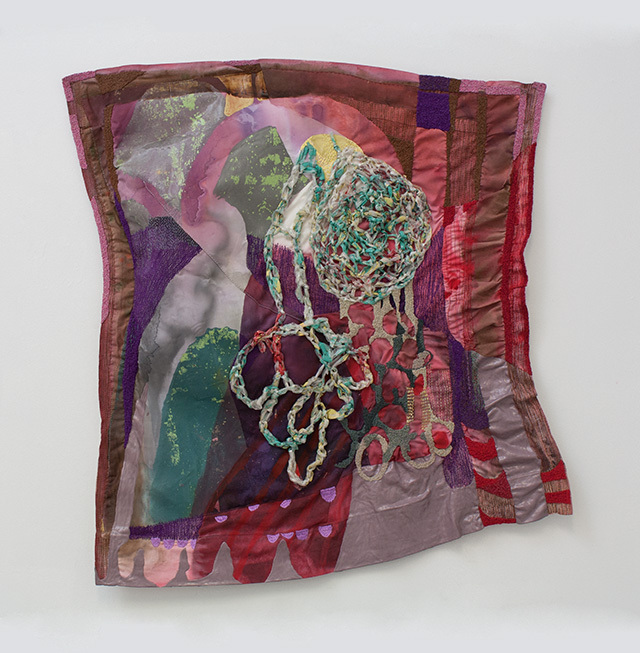 Erin E. Castellan received her MFA in Painting from Indiana University’s Henry Radford Hope School of Fine Arts and her BFA in Textile Design from the Rhode Island School of Design. Following a 2004 Post-Graduate Apprenticeship at the Fabric Workshop and Museum, Erin resided in Philadelphia for six years where she maintained a studio art practice and founded erineleanor, a knitwear company specializing in colorful hats, scarves, and gloves. 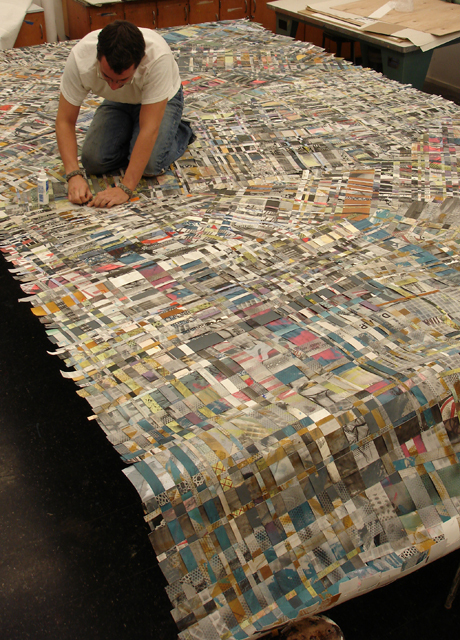 From 2012-2013, Erin was an Artist-in-Residence at Arrowmont School of Arts and Crafts in Gatlinburg, Tennessee. 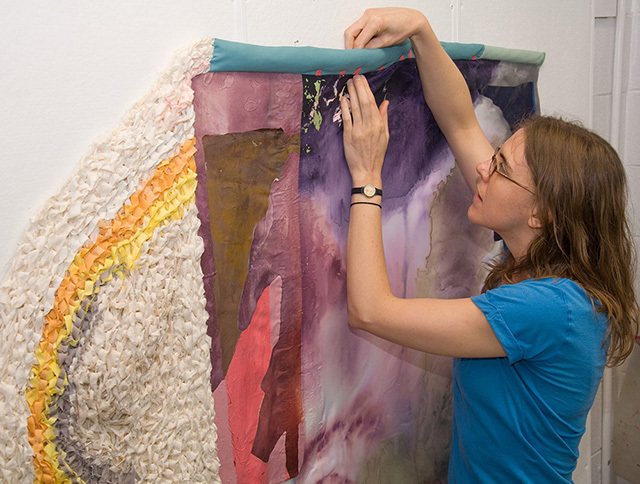 Her interdisciplinary work incorporating painting and fiber media has been exhibited in museums and galleries across the country. She currently lives in Asheville, North Carolina. 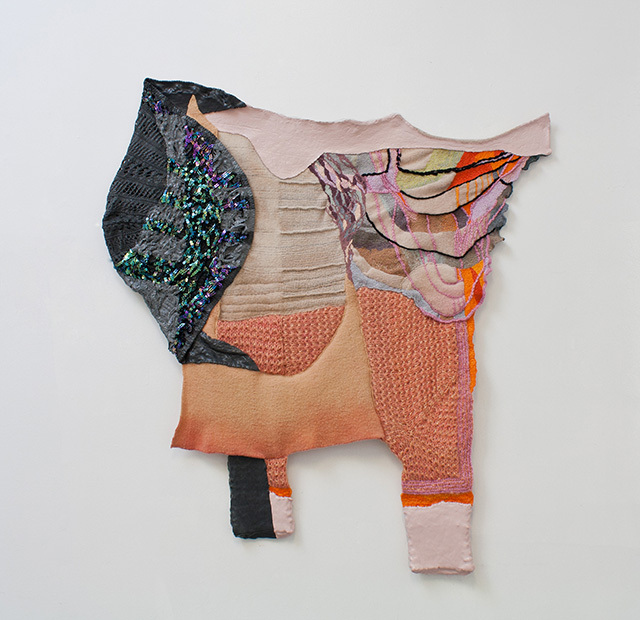 This entry was posted in Uncategorized and tagged Asheville, Collage, Embroidery, Fiber Art, Mixed-Media, NC. Bookmark the permalink.